Our congregations are places where we gather to nurture our spirits and put our faith into action by working toward social justice in our communities and the wider world. There is no formal conversion process, so becoming a Unitarian Universalist (UU) is simply a matter of self-identification. Newcomers are always welcome at UU churches. Membership in local congregations is voluntary and does not require renouncing other religious affiliations or practices. Unitarian Universalism is a theologically diverse religion in which members support one another in our individual search for truth and meaning. We have historic roots in the Jewish and Christian traditions, but today individual Unitarian Universalistsmay identify with Atheism, Agnosticism, Buddhism, Humanism, Paganism, or with other philosophical or religious traditions. Interfaith families often find that Unitarian Universalist congregations are a good fit for them. We promote reason and tolerance in our communities and embrace a free and responsible search for truth and meaning. As members of a non-creedal religious tradition, Unitarian Universalists are encouraged to discern our own beliefs about various spiritual topics. Our members hold wide-ranging opinions on topics like the afterlife, God, and scripture. What unites us is our acceptance of diverse spiritualities and our commitment to making the world a better place for everyone. 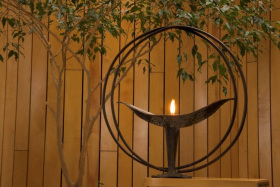 A flame within a chalice (a cup with a stem and foot), represents the Unitarian Universalist Association (UUA) and is a symbol of the Unitarian Universalist faith. Read more about the flaming chalice at the UUA website.